The Bishop of Makamba, the Rt. Revd. Martin Blaise NYABOHO, has been elected by the House of Bishops of Burundi to serve as the fourth Archbishop and Primate of the Anglican Church of Burundi. The Province of the Anglican Church of Burundi is hereby pleased to announce that the House of Bishops held on 21st June 2016, elected The Rt. Revd. Martin Blaise NYABOHO, the Bishop of Makamba Diocese, as the 4th Archbishop and Primate of the Anglican Church of Burundi. Bishop Martin Blaise Nyaboho, attended primary school in Rweza-Ryansoro Commune Gitega Province, before continuing his studies in Kibimba teachers’ college. His religious studies started in Mweya Bible Institute and Matana Theological School for ordination before attending Kenya Highlands Bible College (Now Kenya Highlands Evangelical University) and Asbury University College, KY-USA. The Rt. Rev Martin Blaise NYABOHO was consecrated as Bishop in 1997 and became the first Bishop of Makamba Diocese. The Rt. Rev Martin Blaise also went to Haggai Institute Leadership Training in Singapore and to Panzi Development Training Center in Zaïre (current DRC) and has participated in both local and international conferences and seminars for internship courses on Social Transformation, Leadership, Peacebuilding and Reconciliation, and on Sustainability of the Anglican Church. From 2005 to 2009, Bishop Martin was the Delegate for the Anglican Church of Burundi to the Anglican Consultative Council. In 2008 he became a Delegate of the National Council of the Churches of Burundi to FECCLAHA until 2012. The Rt. Rev Martin has contributed to the local Governance by presiding over the Provincial Electoral Independent Commission as Vice President in Makamba during the national elections in 2010 and presided over the same Commission as President in 2015 elections. Bishop Martin Blaise NYABOHO has visited several countries in Africa, Europe, America, Asia and Middle East. His Enthronement is fixed for 21st August 2016. He takes over from the Most Rt. Rev Bernard NTAHOTURI, who has led the Province of the Anglican Church of Burundi from 2005. 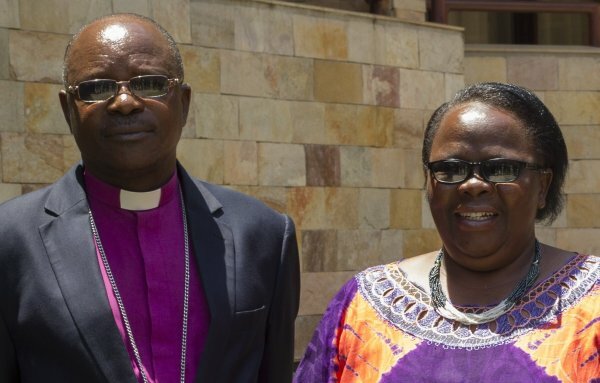 Bishop Martin Blaise NYABOHO is married to Emilienne NYABOHO and has 8 children, six girls and two boys. The Province of the Anglican Church of Burundi appreciates all the prayers and support from partners, friends and family.